Post news Report RSS	Beta 0.6.0 released! Beta 0.6.0 released. Important features: purchasing, new art, new terrain layer, questing expansion, z-order refactor, new items, and bug fixes. Beta 0.6.0 released. Important features: purchasing, new art, questing expansion, z-order refactor, new items, and bug fixes. 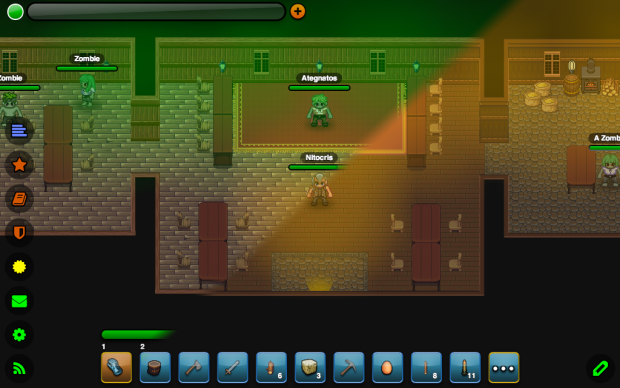 After nearly two years of development, Lugdunon is finally in beta. This means that all of the core gameplay mechanics are in and focus can be directed towards the completion of the GM editing mode, content, general polish, and bug fixing. To all of those who have contributed over these last two years, I would like to offer my heartfelt thanks to you. Lugdunon would not be where it is today without your help. 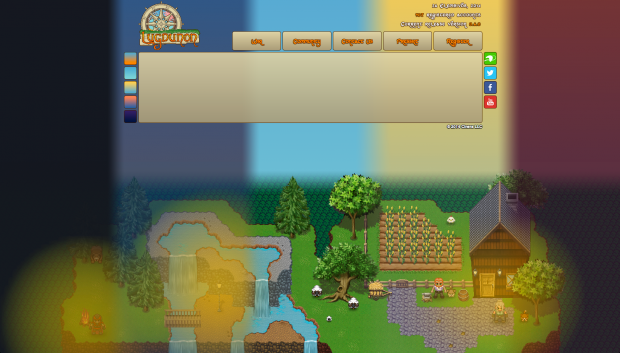 As previously mentioned, Lugdunon is now under early access / beta. This means that access is no longer free, and players that wish to experience the game past the limitations of guest accounts will have to purchase an account key. The final pricetag for a Lugdunon account will be $15. However at the start of beta, the initial purchase price has been set at 2/3 off (or $5) with a gradual rising throughout the beta / early access period, to eventually arrive at the release cost. Account code purchasing is currently handled by Amazon Payments and can be accessed at Lugdunon.net. Of course, a beta purchase still means you'll get full access at release and all future updates at no extra cost. Over the past year, Meagan over at CosmicKitty has been delivering some really great art to take over for the placeholder art that has been in use since the beginning of the project. With the exception of the character sprites which went in as soon as she finished them, the remainder (and bulk) of the artwork has been patiently awaiting inclusion. There are still a few bits of the main tileset that need replacing, but the bulk of the work is complete, and I am happy to say included in the game for the first time. 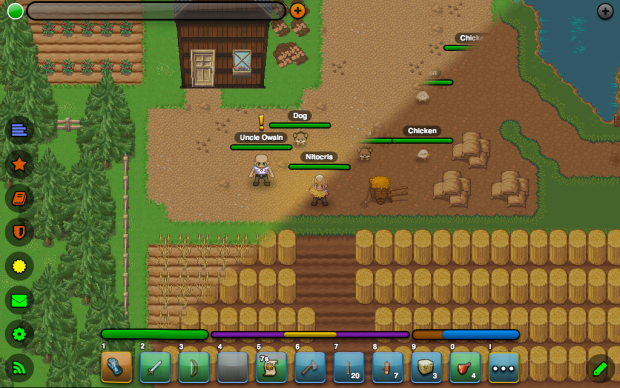 This includes all of the terrain tiles, plants, trees, crops, housing, and more. In addition to all of that, we have started adding in some more dynamic elements to breathe a little life into the environment. At the start, this includes animated waterfalls, ovens, reliquaries, and clocks (a brand new item that will be getting a crafting recipe and some interactivity soon)! 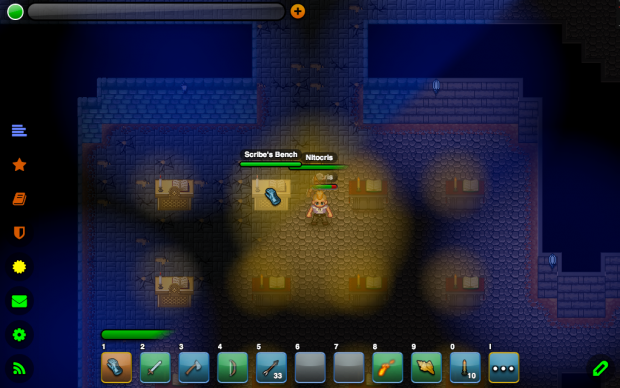 Three new quests have been added to the default campaign along with several new enhancements to the questing code. Quests now have some new requirements available including killing a certain amount of one or more NPC types, and arriving within the proximity of a given NPC. Quest requirement updates can also be activated via NPC triggered actions, which can themselves be bound to an NPC's behavior or to an NPC's dialog. The new quests can be found at the end of the farm quest chain and also by seeking out the Bibracte Captain of the guard, who stands watch somewhere north of the Bibracte market. The z-ordering of in-game elements (placeable items, NPCs, and players) has been in dire need of an overhaul for some time. 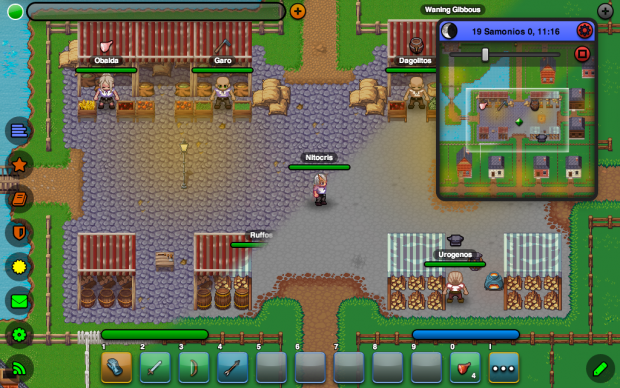 The previous implementation drew all placeable 'background layers' first, then NPCs and PCs, then all placeable foreground layers. This approach lent itself generally well at first, until character sprites began to grow taller than two tiles. The new approach, sorts all elements by their lowest y-tile for placeable backgrounds, character location, or the placeable item's grounding location for the placeable foregrounds before drawing. This allows for a much more natural layering and makes things like crawling into bed, or walking across a railed bridge possible. Fixed issue with automated emails not routing properly. Fixed logging. Logs now properly rollover. Fixed an issue that was preventing placed items from being interactive to players. Fixed error logging in quest instantiation. Fixed an issue with free directional movement not correctly setting the character's orientation. This was the ultimate cause of the unexpected attack values that were being reported. Fixed an issue with the item collection quest requirement that was causing non-stackable items to not register as collected. Fixed an issue preventing the decrementing of a keg's contents when a mug is filled. Fixed an issue that was preventing some actions from correctly affecting the durability of tools. Fixed an issue preventing the access restriction on houses. Fixed an issue that was causing errors when rendering the tooltip for containers and fences in edit mode. Added account recovery link to the client log in screen. Added spawns for gem nodes in the default mine. Turf and cobblestone can now only be placed in the overworld instance. Slate now places cobblestone upon the ground. Creating a new character from a default template now supports values for baseHealthRegenRate and baseStaminaRegenRate. Regen rates for characters increased from 1 to 5. The default lighting detail setting is now "Medium". In instances where a placeable item might be broken down where the placer is not around to receive the inventory item, it will be mailed to them instead. The main website also received a graphical update that changes the background depending upon the time of day. Visitors can also select a specific time of day to view by using the buttons to the left of the main content pane. Ranged weapons are not working properly when a wrap case occurs. Several items are difficult to place (trees being the most egregious example) due to having an invalid cursor offset. Slate / cobblestone placement is not working as intended. Players can circumvent fencing with the use of ladders. Smelting furnace access restrictions are currently not working. 0.6.1 will likely drop mid-week to address these issues. As always, the full change log for 0.6.0 is available here. In addition, the full change log for 0.5.16 is available here. Is it possible to install it than play it in the navigator ? Not yet, but native clients for iOS, Android, Windows, MacOS, and Linux will be coming. Perf is a bit of an issue on mobile at the moment as well, which will be addressed soon. Lovely art update, if the engine supports sprites / decals it might be worth laying a few out, liven up the "clean" game world. If i catch your meaning, support is there and we are slowly getting more dynamic scenery added in. how can i play this game on my android tab? Currently there are a few issues making gameplay problematic on iOS and Android. I am finally releasing the standalone desktop clients tomorrow, which should allow me to devote some time to getting things smooth on mobile devices again.